Thai editor Somyot Prueksakasemsuk may no longer be at the helm of his bygone political magazine, a sharp tongue that mocked a former government. But no matter what the circumstances, Somyot stays true to his love for words. He now works as a librarian in, well, a Thai prison. 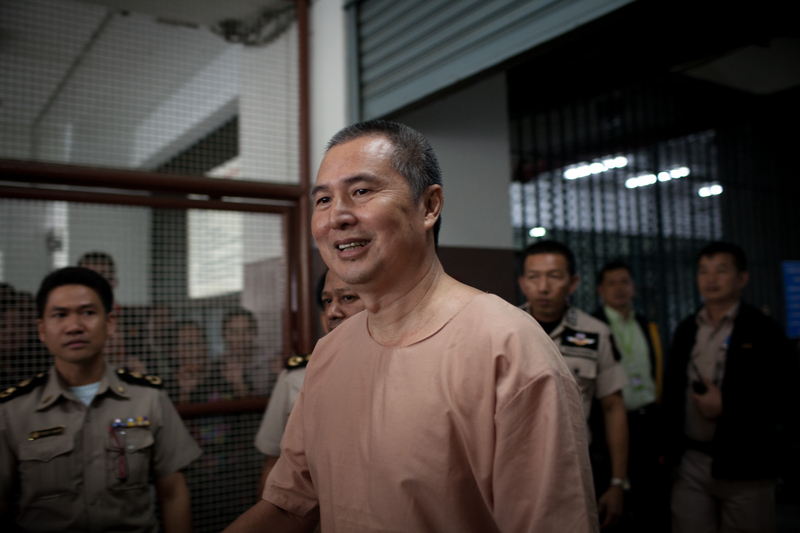 Thai editor Somyot Prueksakasemsuk was sentenced to 11 years in prison late last month. Her husband’s crime? At the height of Thailand’s political crisis in 2010, Somyot published two articles in Voice of Taksin, a defunct political magazine named after the former Prime Minister Thaksin Shinawatra, who was overthrown in a 2006 military coup and now lives in self-imposed exile. The magazine passed off the writing as slapstick fiction. But the court retorted that the satire was a thinly veiled attack on the king, Bhumibol Adulyadej, who the main character resembled. There’s another twist: Somyot didn’t actually write the articles that led to his imprisonment. The real author, Jakrapob Penkair, is a fugitive in Cambodia who put together the pieces under a pseudonym. A former minister under Thaksin, Jakrapob is a founding member the United Front for Democracy against Dictatorship (UDD), a movement more commonly known as the “Red Shirts.” Calling for Thaksin’s return to Thailand, the protestors confronted soldiers in May 2010, sparking a political crisis that left 91 people dead. A little background: Thaksin supporters claimed the ex-premier, who served from 2001 to 2006, was a democratically elected populist. His opponents, known as the “Yellow Shirts”, say he was a gangster whose strongman tactics overrode checks and balances and threatened the primacy of the king. Many of the Yellows are from Bangkok, representing a middle class that, in a drift away from what the West would expect, has turned against the idea of representative government, the journalist Joshua Kurlantzick argues in Democracy in Retreat. It’s an open secret that members of the royal family, including Queen Sirikit, actively peddle patronage amid the country’s political networks. That factionalism and political jockeying means neither end of the political spectrum is immune from Lèse majesté accusations. At the same time, both sides claim to be acting in the interests of the king. Many Thais perceive him as an untouchable figurehead whose on-paper support is needed, for the most part, to get things done in the Thai political scene. Publicly oppose that perception, and arrest is a possibility. As Somyot’s case demonstrates, judges are not just handing sentences to critics themselves, but to people who simply allow others to criticise. He’s not the first editor to be targeted in this way. In May 2012, the same judge presiding over Somyot’s case found Chiranuch Premchaipoen — more popularly known as “Jiew” — guilty of violations of the 2007 Computer Crimes Act. She was lucky in one respect: getting away with a rather lenient, suspended eight-month sentence. Then there’s “Uncle SMS,” real name Amphon Tangnoppaku, who’s become a sort of martyr for the anti-Lèse majesté movement. In May 2012, the 61-year-old died of natural causes in prison after being sentenced to 20 years in prison for insulting Queen Sirikit. Accusers claimed the grandfather sent four anti-royal text messages to a government official, but he maintained that he didn’t even know how to send a text message. It is a reality that Joe Gordon, an American citizen of Thai ethnicity, looks at with disdain. In 2011, Gordon was sentenced to two-and-a-half years in prison for posting excerpts on a blog from a widely available biography of the king. In July 2012, the king pardoned him, a luxury afforded to foreign nationals but rarely given to Thais.